Yes, I know IT IS very hard to even think of planting bulbs when we're into our first week of Autumn (and sweltering to boot). 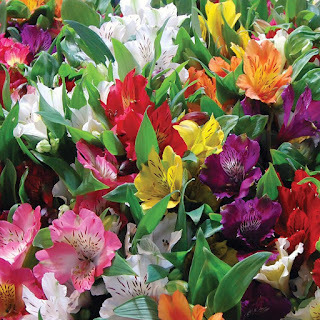 On the Coffs Coast the traditional bulbs eg jonquils, tulips etc can be a bit problematic (unless you are very dedicated or live away from the coast in the hills) but there are some wonderful alternatives out there that can be successfully grown here. Following there are some suggestions that might work well in your garden. It has to be said though, there will be a need for further research to establish if a particular plant is suitable for your area/climatic conditions. 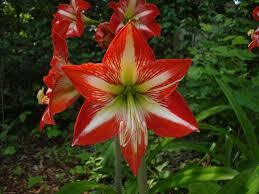 First cab off the rank would have to be Hippeastrum, which grows so well here. Hippies (as affectionately known) make a big, bold statement in the garden. They are expensive per bulb, however they will multiply quite beautifully. Plant in single cultivar drifts or massed plantings and these tough bulbs will reward with a show-stopping display in late Spring. Plant in bright semi-shade for best results. Rain lilies - Habranthus, these little beauties flower profusely after storms (hence their colloquial name) and are a tough little performer. They are terrific in that they multiply quite readily so excellent for sharing with friends. Hymenocallis (commonly known as Spider Lily) are a warm climate gardener's delight. 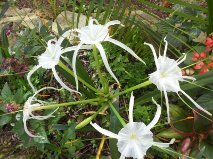 They have spidery white flowers that are set among large, strappy-leafed clumps. These work very well when planted enmass and in drifts. Scadoxus (blood lily) these have fantastic pom poms of red to orange spiky looking flowers. They do enjoy a semi shaded location and flower in early summer - the leaves appear after flowering has finished. 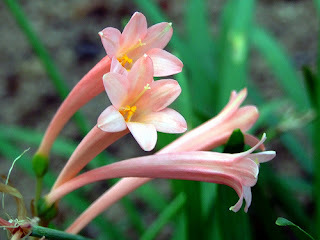 Sprekelia (Jacobean lily) is such an elegant flower with a cross-shaped flower. These are suited to most climates however they are one for us here on the Coffs coast - just remember to top dress with garden lime. Calostemma purpureum (garland lily) a long living native lily with strappy leaves appearing through Spring, followed by red to purple flowers which appear in clusters on compact leafless flower stems in Summer. It's low maintenance, easy to grow and adaptable. Proiphys (Cardwell Lily) these lillies have large, deeply-veined leaves which are very interesting and worthy to grow for them alone. The fragrant white flowers are produced in umbel-like clusters on long stems. They open in succession over a prolonged period and last really well. They will not tolerate any frost so plant in well composted soil in a warm protected area with little sun, or in pots. 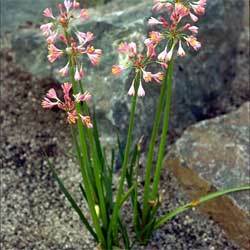 Lastly a garden stalwart Tulbaghia (Society garlic), this tough little guy seems to work in any climatic condition. 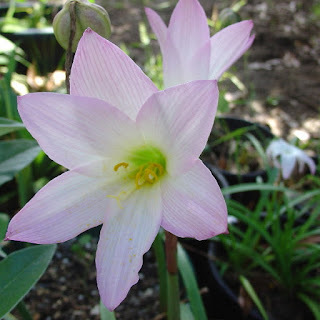 It is a very hardy, clumping bulb which has grass-like foliage and will reward with sporadic flowering throughout the year. 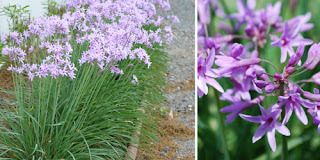 These bulbs look stunning as a border plant or in drifts or even in containers. However, unless you enjoy the smell of fresh garlic these flowers are NOT for the vase! 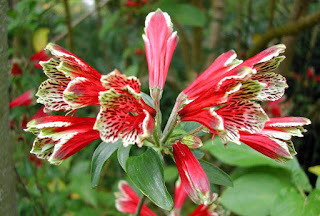 I missed Alstroemeria (aka Princess Lily, Peruvian lily) These fleshy tuberous-rooted perennials come from South America. They were once classified with lilies however, they now are part of the family Alstroemeriaceae. These little beauties flower in Summer, Autumn and Spring. Alstroemerias form a clump of upright stems with mid-green leaves that are usually lance-shaped and slightly twisted. The 6 petalled flowers are clustered in heads at the tips of the tall wiry stems, opening mainly in summer and come in some terrific colours and make excellent flowers for the vase as they keep so well. There is one species Alstroemeria psittacinais which is considered a weed in some areas and from personal experience this little fella has caused many a back ache as I've sweated over it's removal. The tuberous roots snap very readily from the clumps to re-shoot. They generally flower in Spring with delightful 'Christmasy' colours (however in my garden they are done and dusted by Christmas). Thankfully modern hybrids have generally been bred to have a more restrained habit than this wild species. If you must grow this one, I suggest a pot in a courtyard or balcony where its thrown seeds can't germinate! 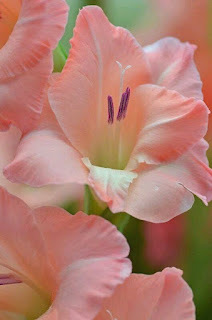 Gladioli (Sword lilies) belong to the iris (Iridaceae) family and are cormous perennials with a flowering season during Summer, Autumn, Winter and Spring. The sword-like foliage ranges from grassy to the trademark sword-shaped. The flowers are borne on tall spikes and are funnel-shaped often flaring open or with ruffled edges. Gladdies require a sunny position with moist well drained soil. They should be planted four times their size deep. They will produce cormlets and these can be harvested to grow elsewhere in your garden. CHGC member Phillip L. grows some stunners in his Coffs garden. 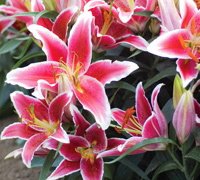 Asiatic lilies require at least six hours of sunlight. Soil has to be well-draining so a raised bed could be the go here on the Coffs Coast as they will rot if they're in soggy soil. They are native to several areas of Asia and can reach mature heights of 1.8 metres! They are early bloomers and produce flowers in a wide variety of bold colours (pictured Black Charm) or pastels in Spring. Once established the bulbs multiply quickly and double every year. 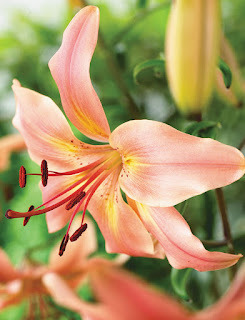 Tiger Lily (Lilium lancifolium or Lilium tigrinum) are tall showy flowers with stiff, sturdy stems. The flowers grow in mass atop a single stem from midsummer and last well in both the garden and vases. They perform best in humus rich, well drained soil in a sunny location (half a day of sun is just perfect). Most folk say that their Grandmother grew these favourite flowers. Oriental lilies are native to Japan. 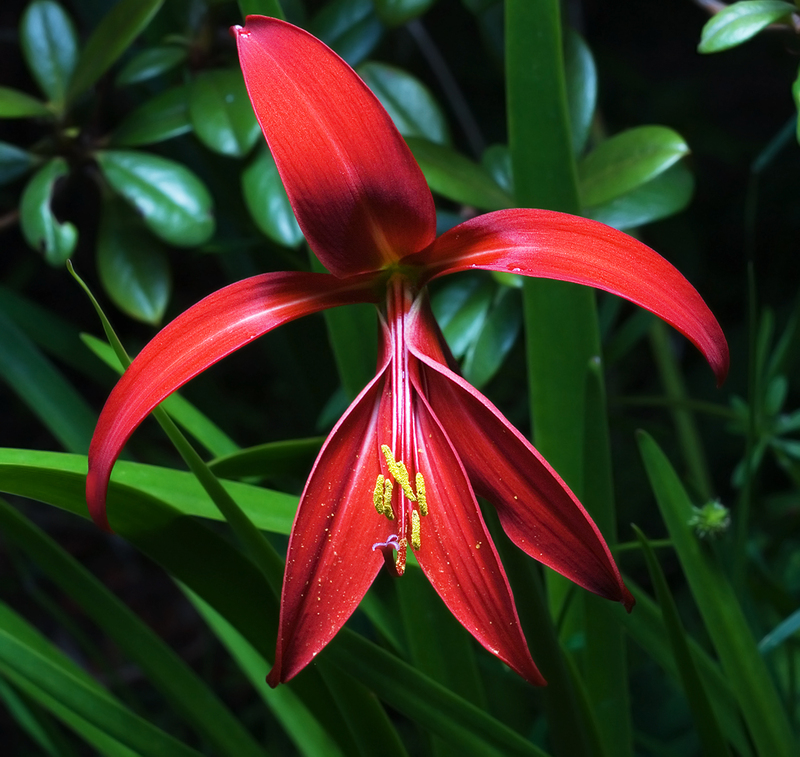 The plants can grow quite tall and are considerably taller than Asiatic lilies and can often be known as tree lilies. The deep green leaves are wider and further apart than the leaves of Asiatic lilies and are heart-shaped. Oriental lilies unlike Asiatic are heavily scented and comes primarily in shades of white, pastel pink and pastel yellow. The bulbs multiply much more slowly than Asiatic lily bulbs. 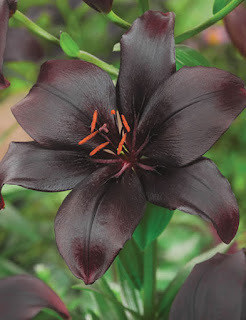 They require similar conditions as Asiatic lilies and will rot if at all water logged. 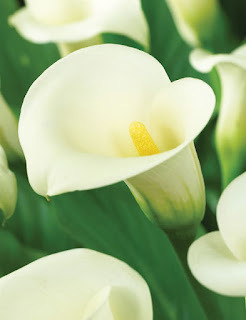 Calla Lily possess a simple, elegant grace that is undeniable. Each flower is set atop a strong, straight stem with sculptural qualities. CHGC member Myles R. (RIP) grew some bobby dazzlers and was very generous in sharing his bulbs, he had a beautiful pink blush one which was just gorgeous. You need to find a location that has good draining soil - as with other bulbs, they will rot if grown in soggy soil. They enjoy filtered light or moderate shade as their leaves will burn in full sun. Flowering is Spring and Summer and they last well in a vase. Crinum (Swamp lily) is in the Amarylidaceae family and there are around 130 species including some that are native to Australia. They are usually found in coastal areas or growing along stream sides and waterways. 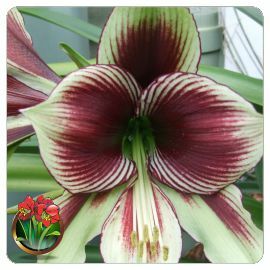 They are generally grown for their lush foliage of broad leaves and very impressive flowers (sometimes scented) in shades of pink, rose or white. Their flowers are very lily-like which are six lobed and large trumpet-shaped flowering in Spring and Summer. Ifafa lilies (Crytanthus spp.) are clump forming and can be a great feature plant in rockeries. They come in a variety of shades including apricot, pink, white and lemon. The bulbs grow best in full sun and perfect for the Coffs Coast. Plant in well drained garden soil - they flower early to late Spring with occasional flowering in Autumn after good rain. 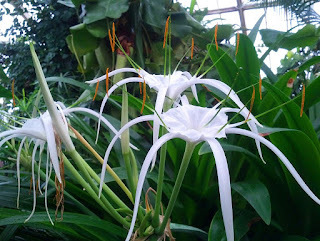 Eucharis Lily (Amazon lily), is a member of the Amaryllis family. This low bulbous plant has broad, glossy green basal leaves and glistening white tyrumpet-shaped flowers and delightfully fragrant. The flowers are borne in clusters of 3-6 blooms on a 60cm tall fleshy stalk. For more reading please visit this link, a post was written about the success of a CHGC member in her's flowering. Eucrosia are members of the Amarylidaceae family. The leaves are deciduous with characteristic long petioles and elliptical or ovate blades up to 25cm wide. The flowers are tubular at the base, green, yellow or red in colour. 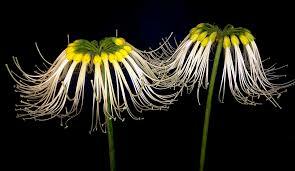 The stamens hang downwards and have long filaments - quite an unusual flower! 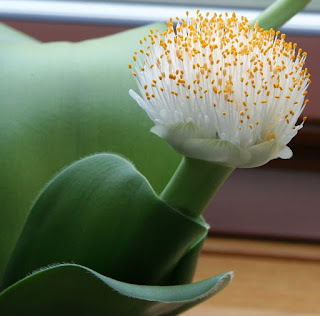 Haemanthus (blood lily or paintbrush lily) are native to South Africa with 22 known species from the Amarylidaceae family. Most have brush-like flowerheads enclosed in four or more membranous to fleshy spathe bracts which usually match the flower colour. The genus produces relatively large bulbs that act as food and water storage organs and consist of fleshy leafbases that may be arranged in two obvious ranks. These grow well here on the Coffs Coast - I was given a blood red one and it has survived - enough said! 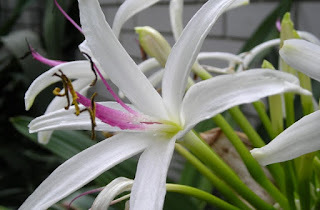 Pancratium zeylanicum is a small tropical species from Asia. Rain induces flowering and development of the glossy foliage. 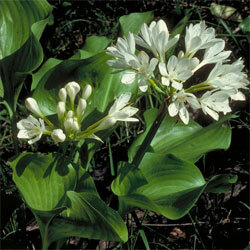 The flowers are particularly graceful and are solitary, growing erect and showy white. Daylily - I guess we should make mention of these as they grow quite easily on the Coffs Coast. Plant in well worked soil which has been improved by compost or manure, the crown should be about 2cm below ground level and about 60cm apart as they develop into clumps. Flowers come in many different colours and edges. 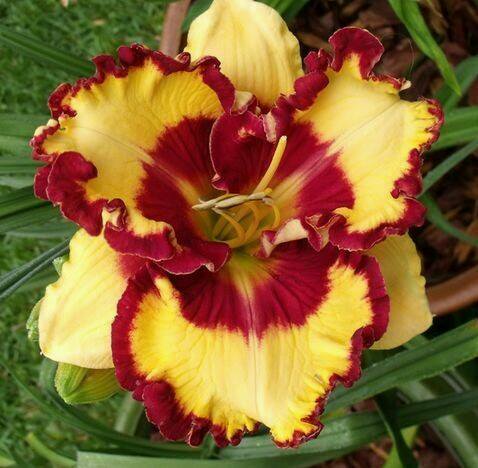 For more on how to grow daylily please visit this link. Check for pests such as snails, lily caterpillars and mealy bug. Remove snails by hand (or encourage a blue tongue lizard to visit), squish caterpillars or use Success Ultra and mealy bug are the very devil - use neem oil a crack. what about Alstromerias they flower for a long time easy to grow and last up to 3weeks as a cut flower.